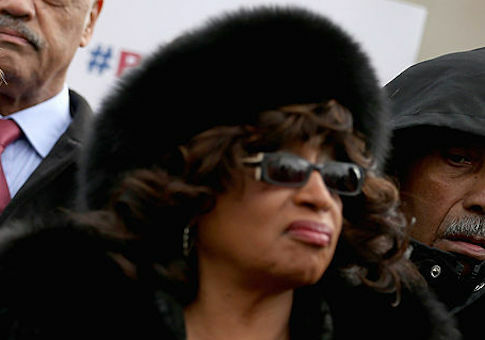 Former Democratic Rep. Corrine Brown (Fla.) is back in court Monday trying to overturn her conviction on charges of fraud and tax evasion connected to a sham charity. Brown's case hinges on a juror who was dismissed from the trial in May when he argued that Brown was innocent because "the Holy Spirit" told him so, the Florida Times-Union reports. Brown's attorneys argue that there should be a retrial because U.S. District Judge Timothy Corrigan wrongly removed the juror, and Brown has a website asking supporters for help with expenses. "While we were disappointed by the outcome, I want to emphasize that this is far from over!" Brown said. "The jury's verdict is NOT final! I will continue to fight!" Brown was convicted in May on 18 out of 22 counts, including wire fraud, mail fraud, and tax evasion. She and her associates received more than $800,000 deposited into One Door for Education, a Virginia-based sham foundation, but they only used $1,200 for charity. Hundreds of thousands of dollars went directly into Brown's bank account, as well as toward NFL tickets, air travel, vacations, car repairs, and events. Two of her associates, including former chief of staff Elias "Ronnie" Simmons, pleaded guilty and agreed to testify against Brown. The former lawmaker insisted at various points that she faced backlash for fighting racism and injustice, but now her appeal hinges on the dismissed juror who claimed to hear from "higher beings." Corrigan removed the juror in question due to rules allowing him to consider only evidence presented in court. Now he will judge Brown's appeal. It is unusual for a judge to agree to a new trial over their own mistake. Brown has asked for personal support in her attempt to reverse the court's decision. "I hope the courtroom will be filled with my supporters!" she wrote on the website raising funds for her legal expenses. This entry was posted in Issues and tagged Corrine Brown, Fraud. Bookmark the permalink.